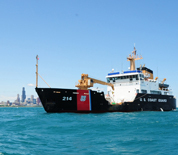 The US Coast Guard Sector Lake Michigan is headquartered Milwaukee, Wisconsin. Sector Lake MIchigan is responsible for marine safety, disaster relief, environmental protection and law enforcement within the region. Ports and regions that fall under the responsibility of Sector Lake Michigan include Chicago, Gladstone, Green Bay, Grand Haven, Milwaukee and Sturgeon Bay. The Sector is responsible for managing two morale cottages that can be utilized by authorized MWR patrons. The Sherwood Point Cottage is a beautiful single-family house overlooking Sturgeon Bay, and Rawley Point is home to three rental units at Point Beach State Park adjacent to a lighthouse overlooking Lake Michigan. This USCG Sector Lake Michigan directory features the critical info you’ll need to navigate through the many facilities and recreational opportunities available on base.